You will need about one or two teaspoons of lemon zest once it is minced and you can cut it from the half lemon. Just make sure you remove only the outer yellow skin and not any of the bitter white pith underneath. First cut slashes all over the chicken pieces. 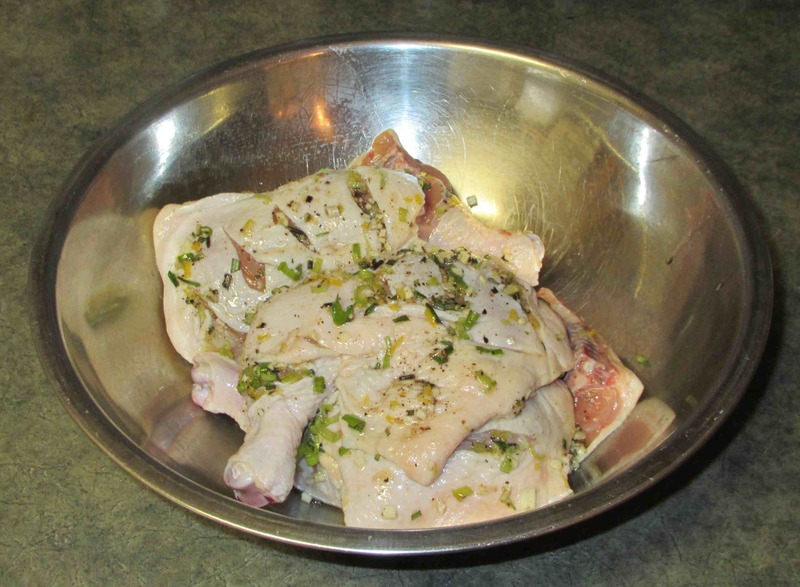 This is a step that my readers will often see me do with chicken as it allows more of the fat to drain away and allows any marinade or seasonings to penetrate the meat. 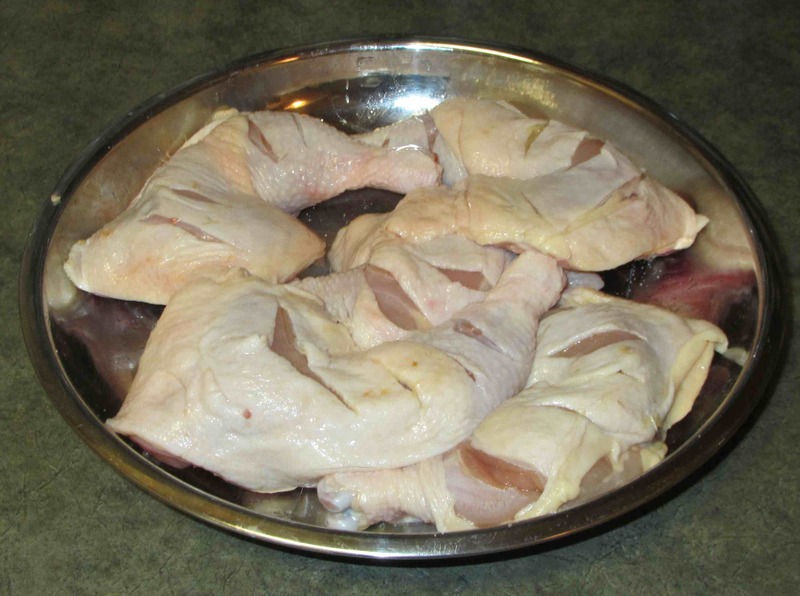 Next, rub the pieces with the salt, then the lemon juice, and set the chicken aside. Crush the peppercorns to a powder in a mortar and then finely mince the garlic, lemon zest, scallion and the rosemary needles. 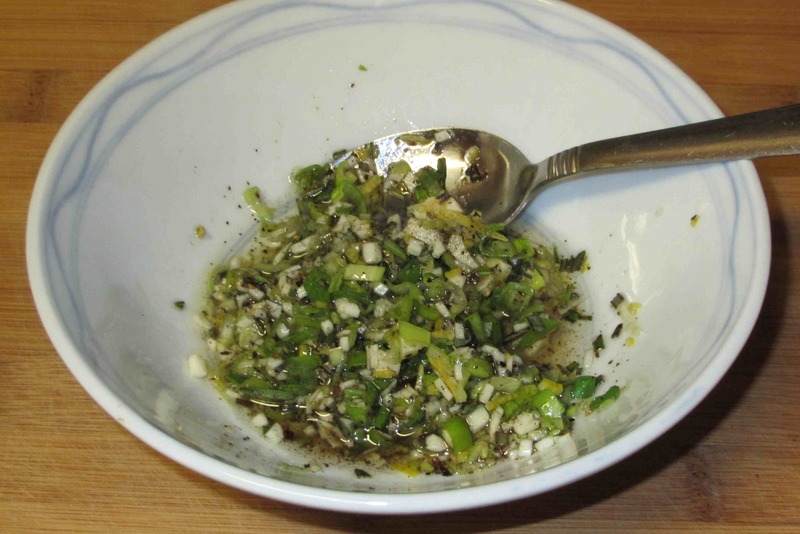 Put everything into a bowl with the olive and leave everything to rest for at least thirty minutes or so to allow the flavors to meld and permeate the oil. Next, coat the pieces of chicken with the oil and seasoning mixture, rubbing it into the slashes and getting as much as possible under the skin. Set aside to marinate for several hours or overnight in the fridge. 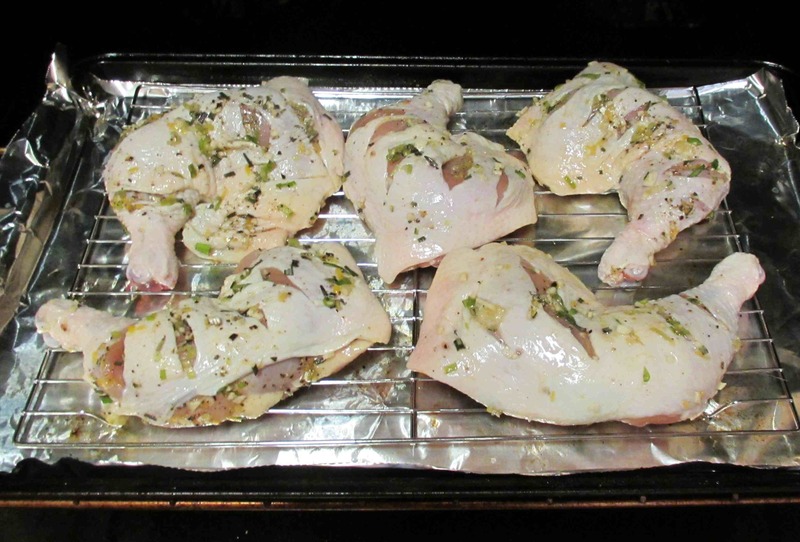 When you are ready to cook, pre-heat your oven to 375 degrees and put the chicken pieces on a wire rack over a baking sheet. Pop them into the oven and cook, turning once or twice, for about an hour. When the chicken is nice and golden and the meat cooked through, remove the pieces from the oven and let them rest for 5 minutes or so before serving. 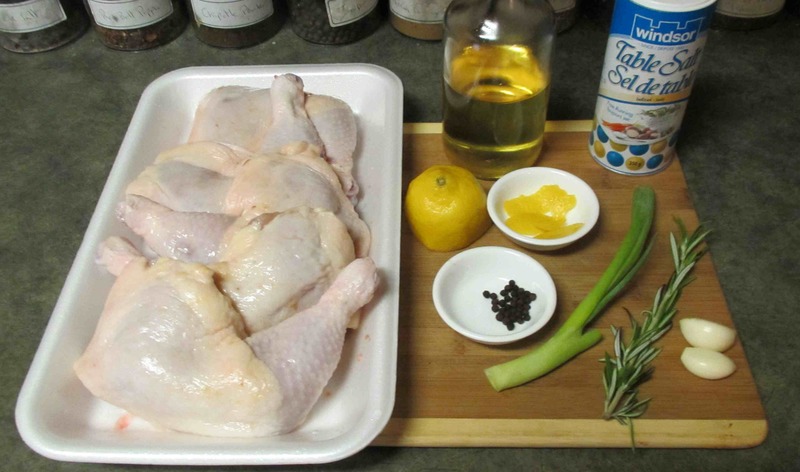 This is a great dish…very similar to what I made tonight…my kids favorite roast chicken….olive oil, lemon and zest, rosemary and oregano, garlic and onion, pepper and Murray river pink salt. Thank you …. I don’t know the Murray River Salt. Good? very good…. A light pink color and flakey… good for cooking and perfect fro finishing! Interesting, I’ve been looking for a good recipe for some kind of “lemon chicken” (why that, specifically is a long story…). Think I will try this out some day, and I’ll be sure to let you know my verdict ! I’lll be happy to hear any reports! Great looking and sounding chicken dish! I will tell you that you should have enjoyed this! It is very similar to one I do and it is very very good! You should come and visit me this week – I have pics from a local produce stand I think you would like. I know the prices will probably make you scream. But it costs a lot less to transport from a field to the stand than to fly it way up north! This sounds great! 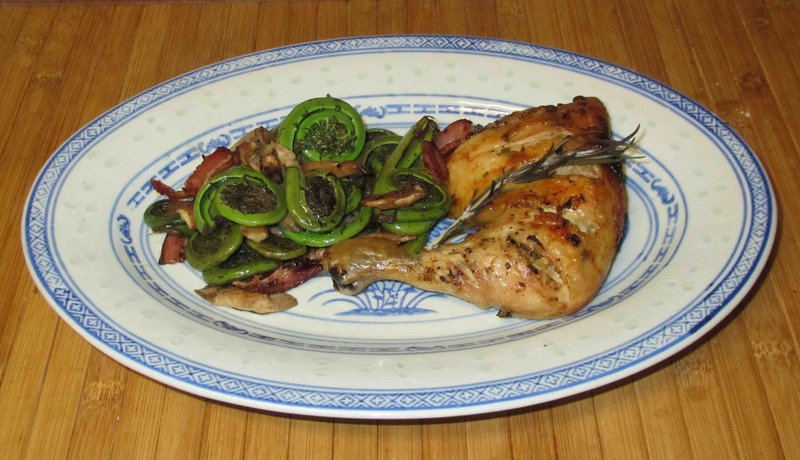 I am actually making a chicken dish this week and will give this a try. I’ll let you know how it goes. You’re absolutely right, this is how my “Zia Nonna” used to make her chicken, with lemons and rosemary plucked from her gorgeous orchard garden! Yummy! 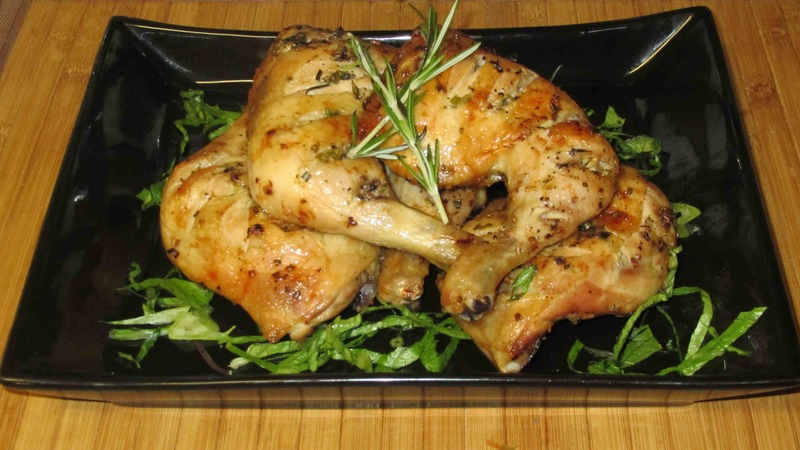 Chicken is so versatile – and with lemon, garlic and rosemary its guaranteed to be scrumptious. Sounds great – and good tip about slashing the skin – but I’m still trying to work out whether “scallion” is what we Aussies call spring onion? or shallots? We tried this and enjoyed it very much! Never thought to makes slashes in the chicken which is a great idea. Now my husband wants to know which one of your recipes I’m going to make next!